Frankston Motel is the only motel on the main road between Melbourne and Mornington Peninsula, just three kilometres south of Frankston's town centre on the corner of Bartlett St at 233 Frankston-Flinders Road. GPS: Corner of Bartlett St and Frankston Flinders Rd St Frankston South. (or you place 3 Bartlett St Frankston South. You will see our Frankston Motel sign on Frankston Flinders Rd on the left hand side coming from Melbourne. Off the Frankston Freeway in Frankston you will come across X3 petrol stations on each corner. Head straight – onto Frankston Flinders Rd Go pass –Bunning’s Warehouse Store on the left hand side. Go pass IGA, McDonald’s and BP petrol Station on left hand side. Keep driving down at a set of lights you will come across Robinsons Rd and a Shell petrol Station on the left hand side and just a bit after the petrol station you will see Frankston Motel on left hand side. When driving from the city onto the Peninsula Link. Exit onto Golf Links Rd Turn Right on the set of lights heading onto Golf Links Rd Second round about turn left onto Robinsons Rd At the end of Robinsons Rd (Shell Petrol Station on left hand side) Turn Left at the light’s you will see Frankston Motel. Follow Nepean Hwy all the way into Frankston Turn left into Davey’s St Go pass the Frankston Hospital At the end of the road you will see Monash University Turn right at the set of lights Go pass IGA, McDonald’s and BP Petrol Station on left hand side. Keep driving down at a set of lights you will come across Robinsons Rd and a Shell petrol Station on the left hand side and just a bit after the petrol station you will see Frankston Motel on left hand side. We are an ideal base, located 40 minutes drive (or 1 hour train ride) from Melbourne. The southern tip of the Mornington Peninsula (Portsea) is an hour’s drive (or a 1.5 hour bus trip). Want to take in Phillip Island, the Dandenong Ranges or Yarra Valley? 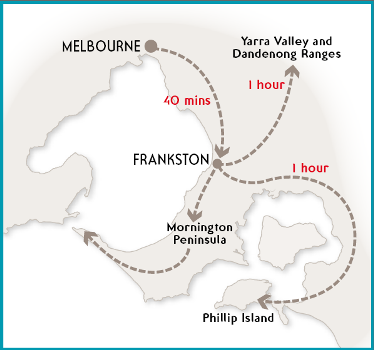 All three regions are only an hour drive from Frankston as well.